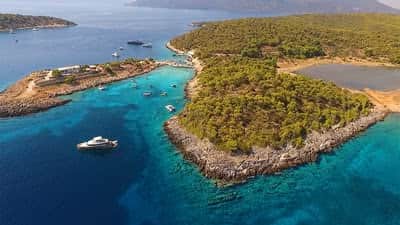 Home to fascinating culture and some of the most beautiful beaches in Europe, Albania is the next big hit of the Balkans. But you better hurry, because the word is out! With majestic snow-capped peaks and unspoiled rugged coastline, the natural beauty of Albania will make you wonder why this destination is known as European’s underdog. Mostly ignored as a tourist destination, recent years have seen Albania flourish. Unlike other European countries, you can explore 2000 year old Roman ruins nearly tourist free in this off-the-beaten-path gem. Stony beaches and gorgeous turquoise waters make Albania’s beaches some of the best in Europe. Unlike their more famous neighbours, the beaches in Albania are nearly crowd free. But you better hurry, because the word is out! Be sure to check out “The City of a Thousand Windows” in one of the oldest continuously inhabited regions in the world, Berat and trek the Accursed Mountains scattered with traditional villages and farms. Enjoy breathtaking sunsets and try the traditional “rakia” or Balkan moonshine. You’ll have one of the best nights (but worst mornings) drinking this loved Albanian drinks! In Albania, you’ll not only be warmed by the gorgeous beaches and sunshine, but alkso by the incredible generous people. Albanians are known for their amazing hospitality, and travelling here is just as safe (if not more) than other hot spots in Europe. In fact, Albanians live by the code of “besa”which basically means it is their duty to look after the people who visit Albania! The best time to visit Albania is between April and June, or September and October when the weather is perfect for both the mountains and the beach. July to August is peak tourist season and scorching summer heat.